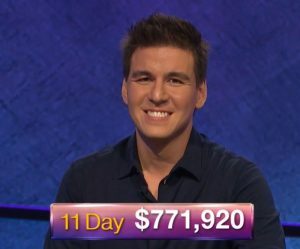 Andy Saunders of thejeopardyfan.com discusses recent Jeopardy! episodes with 7-time champion Josh Hill and recent contestant Ross Belsome! Today’s Final Jeopardy answer (in the category Oscar-Nominated Actors) and game statistics for the Friday, May 25, 2018 game between Ross Belsome, Virginia Cummings, and 7-day champion Josh Hill. We’re done with the Teachers Tournament and Josh Hill returns as champion after having won 3 times for over $80,000! See who joins him here!